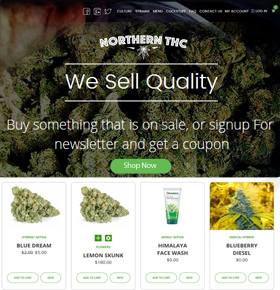 Northern THC deals in the highest-quality marijuana products for medical and recreational use in USA. The project goal entails creating a nopCommerce online store for the existing business of the client. We designed the theme and various pages of the website as per the need of the client. Our experienced nopCommerce developers created the online store with cutting-edge features for delivering the best online shopping experience to the users, i.e. Strains, Cool Stuff, Featured Products, Age Validation, Country Validation, Country Validation, Menu, etc. For user engagement, we integrated the “Blogs & Events” section into the website. Also, we integrated a user-friendly shopping cart system into this nopCommerce online store.